When the $18 billion global food giant General Mills started targeting Denver cannabis consumers with ads for a line of frozen snacks recently, local marijuana professionals took notice. 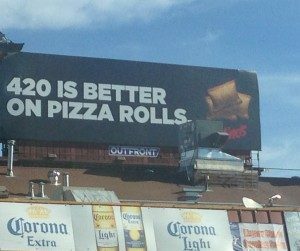 One executive even snapped a photo of a large billboard that promotes the snacks – Totino’s Pizza Rolls – by referencing the 4/20 cannabis holiday. 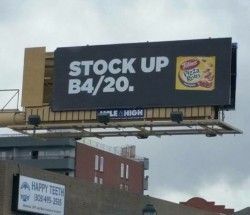 “I caught one on Colfax Avenue, so I took a picture of it and said, ‘It looks like we’ve really gone mainstream with this Totino’s Pizza Roll billboard,'” Joe Hodas, the chief marketing officer at infused products maker Dixie Brands, told Marijuana Business Daily. The bold advertising move, which includes billboards and ads on buses that include slogans such as “Stock Up B4/20,” is both promising and frustrating for those in the marijuana industry. On one hand, it shows how large mainstream companies are starting to take the cannabis market seriously. On the other hand, the fact that General Mills can target marijuana consumers via multiple billboards and city buses around Denver while cannabis companies in most states are largely barred from doing so highlights the uneven playing field for MJ businesses. The Totino’s ads even spurred a discussion among Dixie’s marketing staff over just this issue. This isn’t the first time Totino’s, which is owned by global food giant General Mills, has tried to appeal to marijuana consumers. Other mainstream companies have tried to make inroads with cannabis consumers by utilizing cultural jokes and phrases. But while Totino’s may not be the first mainstream company to dip its toes into cannabis-related advertising, the number of billboards and other ads that it paid for in the Denver metro area may very well be a milestone. “I seem to recall one other time that I saw (something similar), but not en masse,” said Ean Seeb, co-founder of the cannabis retailer Denver Relief, who also drove by one of the Totino’s billboards on Tuesday and has seen them on the sides of city buses. Seeb added that the Regional Transportation District, which operates bus services in the Denver metro area, must have had to approve the ads knowing that they reference marijuana. General Mills did not respond to multiple requests for comment from Marijuana Business Daily, so it’s unclear just how many ads the company paid for around Denver, how much it invested in the ad campaign, or if it’s posting similar ads in states other than Colorado. But Seeb, like Hodas, said the incident highlights the limitations of marijuana-related companies to advertise their own products and services. “I wish the same opportunities were afforded to those of us who are actually in the industry,” Seeb said. Policy analyst Andrew Livingston, who works for the Denver cannabis law firm Vicente Sederberg, said advertising and marketing restrictions vary greatly across the state depending on local ordinances, but the umbrella state law is quite restrictive by itself. “The only big public billboard or sign that you can have under state law is the one on your zoned lot,” Livingston said. For plant-touching companies such as retailers or edibles makers that want to advertise in print or online, he said, the bar is that the company must be ready to present “reliable evidence” that no more than 30% of that outlet’s audience is under 21 years old. That’s not an easy threshold to meet, and the consequence is there’s a real dearth of actual marijuana-related ads in the public domain. Other states have similarly strict advertising limitations. One of the ways cannabis companies try to work around such limitations in Colorado, Livingston said, is by sponsoring things such as highway cleanups. Doing so gets their names on small signs on the side of the highway. “It’s a frustrating issue, (but) I applaud a company like General Mills that isn’t banned from advertising” trying to target the cannabis crowd, Seeb said, adding that he’s certain the Totino’s marketing ploy won’t be the last such gimmick to appear in states with legal cannabis. I’ve seen O.pen Vape ads on billboards around Denver. How do they do it? Because O.pen is also a hardware company in selling electronic vaporizers, I believe they have figured out a loophole whereby they are not breaking any laws or regulations. Isn’t that the same thing as pizza rolls? They’re not selling a marijuana product; they’re selling a federally legal product that people who ingest marijuana may or may not want to eat. The double standard for advertising guidelines between cannabis companies and mainstream CPG’s is a gap that needs to be closed. The Fortune 100’s have their eyes on this industry and can easily dump hundreds of millions into media. It’s that that far out that we’ll be seeing this….within the next two years. I love it. As a cannabis business owner I see these bill boards as driving consumers to our market. They’re also helping to desensitize the conditioning of reefer madness. I say, “Keep on the high road GM! !” We can use all the help we can to break down the silly advertising barriers. Mike Elliott and the MMIG led the push to ban outdoor. Seemed short-sighted. Wonder if they have them in non legal city’s …. What would the people say then…. Ain’t it legal in Denver but for real you know you be high wit the munchies and don’t know what to eat…. Their ads on the back of pedicabs in downtown Denver say “Pass on left”. Funny but I would never eat that stuff. Speaking loudly to an advertising advantage, or is it? An advantage that is…is this how we really want Cannabis to be viewed? The vast majority of people on the consumer end may find this amusing but when push comes to shove there is a deep seated sense of respect for the plant and its great benefits. As the roll out of legalization continues what we might wish to give more attention to is a perspective that says “This is medicine, effective for many ills, mundane to clinical and chronic conditions” Throughout recorded human history medicinal plants have always been held with great respect often considered sacred because of those qualities. As an industry that comes from such a noble past there are attitudes that should be retained. It’s not like corporate America with all of its marketing schemes and profit mongering has done the world any great favors and they are absolutely not the benchmark for the future. The culture of cannabis has opportunity to create a model that addresses a global future that shows restraint, environmental sensitivity and social relevance.